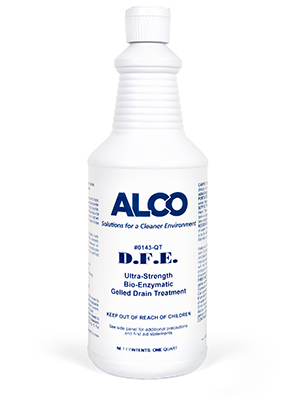 Alco Drain Fly Eliminator - Alco-Chem, Inc. This product is a thickened, concentrated gel that clings to pipes and traps, coating the organic material. Fruit flies are attracted to food sources in kitchen areas around drains, so this action is helpful where those are concerned. It eliminates odor caused by spoiled food, vomit, decomposed animals, and waste receptacles when sprayed directly on malodor and bacteria action is allowed to work. Use in restaurants, bars, kitchens, hospitals, septic tanks, or wherever organic matter is present in drains.